Calling all puppetry loving Brisbane folk! I’ll be heading your way in a few weeks for the September school holidays! Small group or family bookings available! I’ll be performing my popular Punch and Judy inspired show at the Canberra Cares Festival this Saturday! My show is on at 11:00am-11:30, but the FREE festival will be on most of the day. We had a fantastic time performing at the National Museum for the 50th birthday of Playschool! It was an absolute honour to share the stage and meet with the TV stars from Playschool – as well as hanging out in the backstage area with the Playschool toys Big Ted, Jemima, Little Ted and Humpty! We performed our show twice across the day. 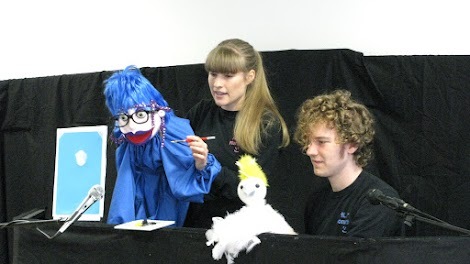 Our show, full of music, crafts and puppets, was centred around using your imagination with things found around the home. Special thanks to Kellie Robson and to the National Museum for having us and also sharing their beautiful photos from the day with us. Thanks also to the National Archives of Australia for helping fund the creation of an initial version of the show of which some parts were taken. I’ll be presenting a series of free “Puppet Mania” programs at the Belconnen Library during this upcoming July School Holidays! Last weekend, I was a guest speaker at a wonderful Storytelling event for Canberra teachers at the National Library of Australia, hosted by ALEA – Australian Literacy Educators’ Association. In my presentation, I spoke of my experience in running my business, the fundamentals of puppetry, my research and findings in the benefits of using puppetry in education, therapy and as as a medium for storytelling. During my presentation, I provided fun and simple activities, demonstrating how puppetry can be an excellent non-threatening, fun, relatable and easy to use teaching tool for many things, including storytelling. I would like to extend a big thanks to the team at ALEA and Robyn Watson who got me involved with such a valuable event. Many thanks to Renee Gill for taking photos.